It’s been over 18-months since we first featured the stunning work of Dutch animation studio Anikey and their darkly comic short Little Quentin. 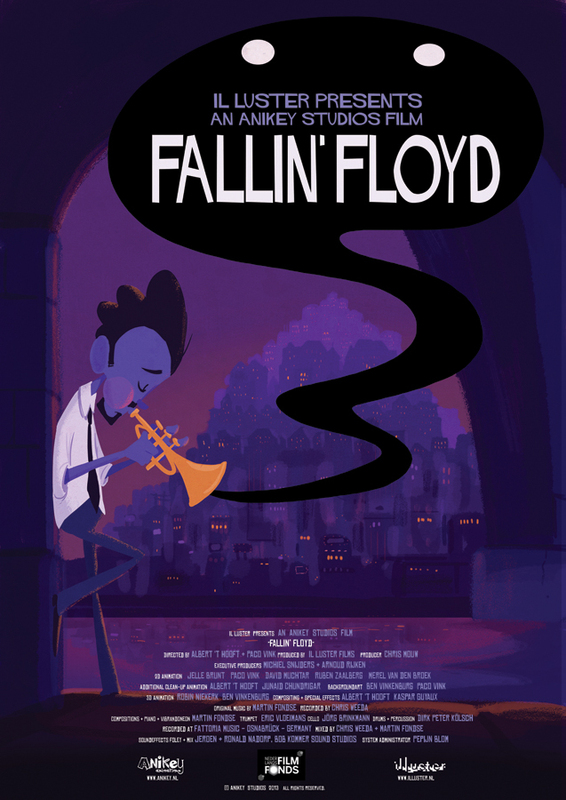 Now returning to the short film arena with Fallin’ Floyd, taking a break from creating their first feature film, the ever-impressive directorial duo of Paco Vink & Albert ‘t Hooft are back with their eye-catching animation style and another dialogue-free narrative. After being dumped by his girlfriend, Floyd suffers from psychological problems manifested as a little demon who disrupts his everyday life. Floyd has to go through great depths before he can continue his life. Where did the concept for Fallin’ Floyd come from? Paco: It was a combination of different ideas we had. Back when we were still in Art Academy (around 2005) Albert already developed some rough ideas about a man with an annoying demon creature on his back, interrupting his daily business. I also had an idea about a depressed bear who would get his heart literally ripped out and starts looking for a new one while falling from one scene to the next. When we started writing a script (in 2009) we threw these ideas together and at the time we pulled from our own experiences in failed relationships and the negative feelings that come with it. There’s a delicate balance of light and heavy in the narrative of the film, how concerned were you with getting this balance right? Albert: We always wanted this to be a funny film with a dark tone. In the end we did want the story to have a positive message about not giving in to your depression, no matter how terrible things may seem. So in order to do that, you should be able to not take your problems too seriously and try to laugh at them. Comedy also comes from suffering, so there is always that balance; it’s sad, but funny at the same time. Like Little Quentin, your latest short is dialogue-free. What is it that attracts you to working without dialogue? Paco: For us, telling a story mainly through visuals is a very effective way of getting feelings and points across. 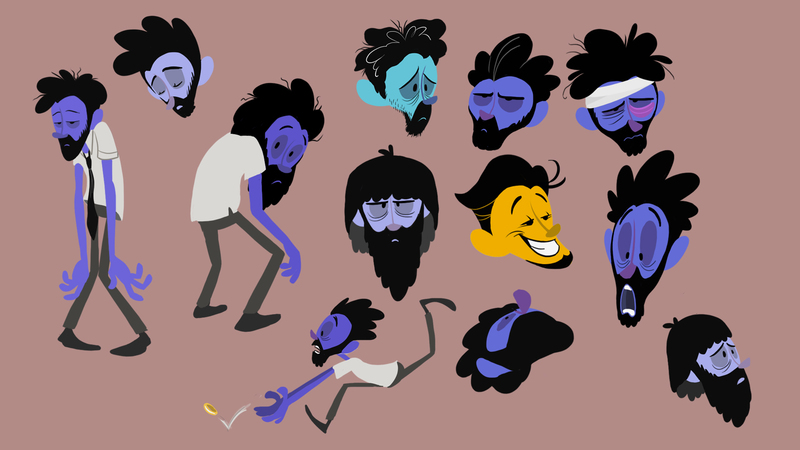 Animation is of course an excellent medium for this. If you’d switch off the sound and still completely get what’s happening on the screen, then you have good storytelling. Of course the music then adds a lot of the emotion to a film. Dialogue can do this as well, but for us it’s more like the icing on the cake. You don’t always need it to tell a solid story. As expected, the animation is a joy to watch. What can you tell us about the production? How many people worked on it, how long did take, what techniques and tools did you use? Paco: The production was actually quite fragmented as we switched between storyboarding on our feature film and also worked on various commercial projects. Albert: As often with animation, production on this film took far longer than we originally had planned. During the different stages of the production we had about 4 to 5 artists working on the film. 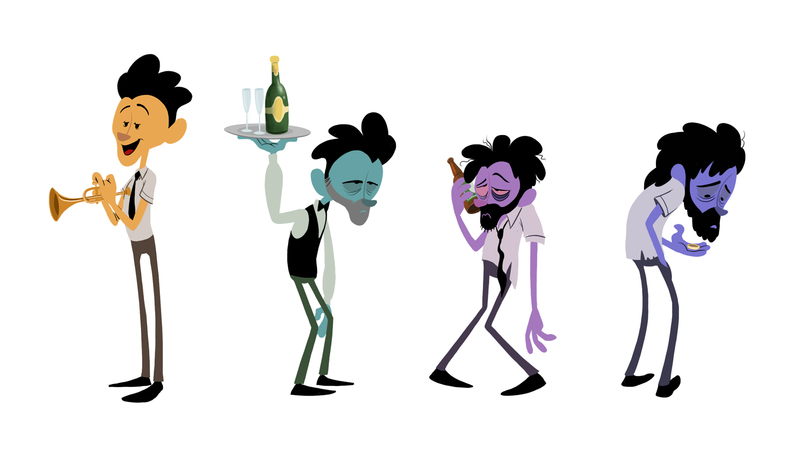 Paco worked on the character designs and animation together with Jelle Brunt. We also had two very talented 2D animation interns, who are now working on our featurefilm as well: Ruben Zaalberg and David Muchtar.Ben Vinkenburg did a lot of concept art on the environments, colors and development of the 3D animation and environments together with Robin Niekerk. All the time added up we spent on it, from storyboard to final rendering, was probably about 14 months. The animation was done in ToonBoom Animate Pro, backgrounds were painted digitally in Photoshop, and then we used Digital Fusion for most of the compositing. One of the biggest challenges was trying to tie all the shots in the film together, creating a feeling that Floyd is actually falling from scene to scene. That gave some real headaches for some of the scenes. Near the end of the production we fortunately had some great help by compositor Kaspar Guyaux. 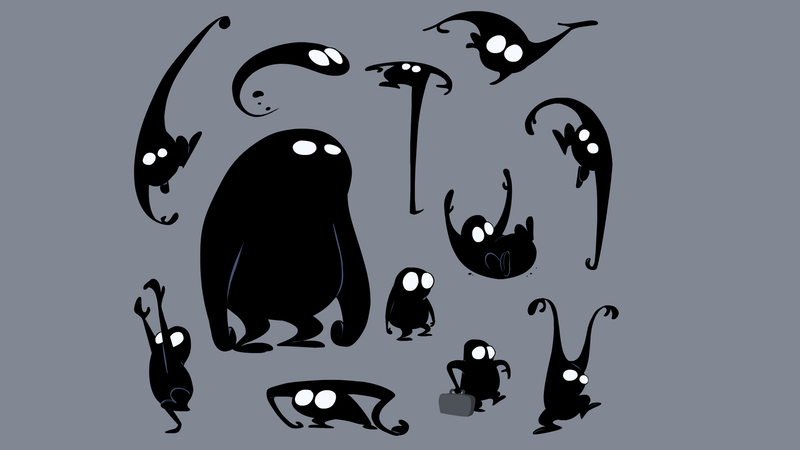 For me, one of the things I loved about the animation was the design of the demon character – how did you go about creating his appearance and were you ever tempted to add any embellishments to his design? Albert: We started to think about how thoughts and emotions can effect your physical movement. So if we were to give these thoughts a physical form it would have to be one that is flexible and scales depending on how you feel. We tried to give the demon some animal characteristics and the larger it grew the more out of control and distorted it becomes. Paco: We tried to keep it as simple as possible. I think we tried some variations with horns and tails once but that didn’t feel right. For a while the demon also had a small suitcase in the beginning of the film, which looked really funny, but didn’t make much sense so we scratched that. Colour appears to play a vital part in Fallin’ Floyd with the palettes changing along with the narrative. How did you go about picking the colours for each scene and how do you hope the audience reacts to their use? 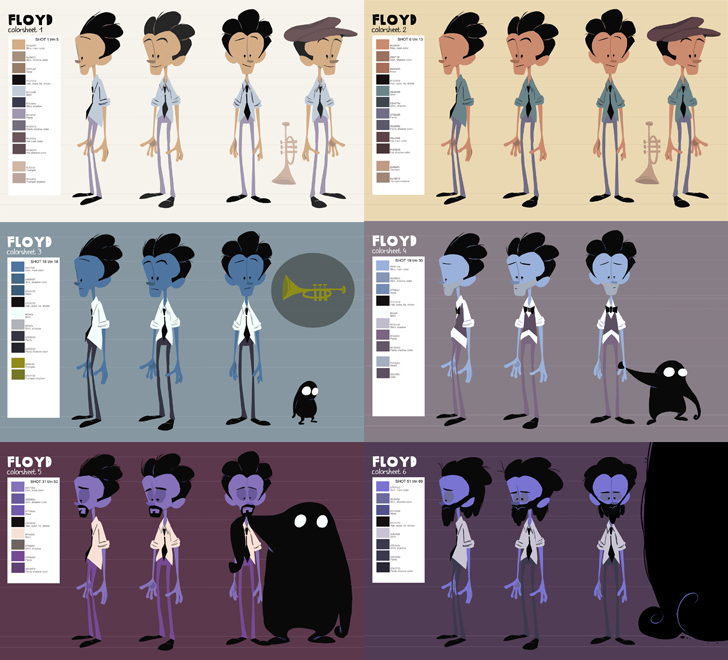 Albert: We developed an entire colourboard for the film, as with the colour palettes we tried to amplify the different types of emotions in scenes. So the more depressed Floyd got, he went from a healthy pink to blue, to a dark purple. Same goes for the backgrounds. It’s nice if the audience notices these changes, because they are clearly visible, but it should never distract them from the story. At the heart of the film, driving the pace and flow is an inspired soundtrack and carefully considered sound FX, what do you think the sound design adds to the film? Paco: Originally we approached the composer of our previous short films, Maarten Spruijt, since working with him was always a pleasure. 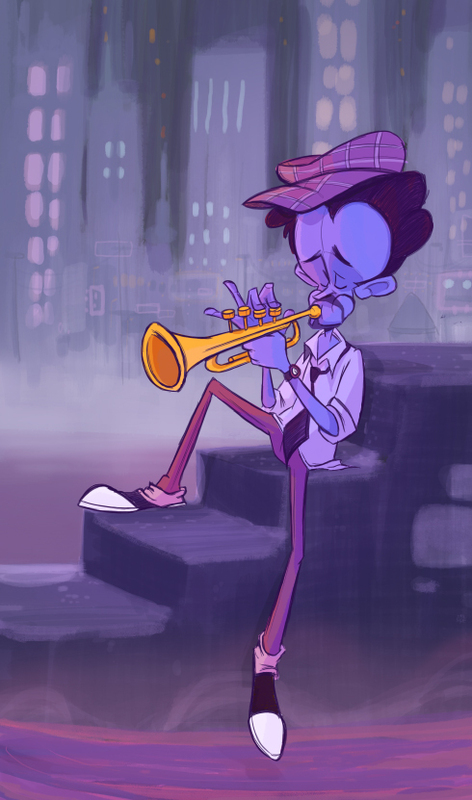 Unfortunately he wasn´t available at the time and we quickly had to start looking for a new composer, because we needed to have music to animate the scenes of Floyd playing the trumpet on. It took a while to find the right composer for the project, so we actually had to use a temp track to animate on. Eventually our producer Chris Mouw of il Luster Productions arranged a meeting with composer Martin Fondse at their office. At that time most of the animation was finished, Martin had seen it and was interested in doing the soundtrack. After a couple of weeks he’d finished writing all the music and sent a few midi demos. Martin wanted to record the music the next week in a sound studio in Osnabruck, Germany, together with Eric Vloeimans, one of the best and most famous trumpet players in Holland. Listening to the midi files, it was difficult for us to get a good taste of what the music actually was going to sound like, so we were really excited and curious when we drove to Germany. The evening we arrived at the studio, Martin sat behind the piano and started to play some of the music he wrote. Immediately we could hear that the soundtrack was going to be fantastic. Martin really nailed it and it was quite special to be in the studio with these talented musicians for 2 days. Albert: When the music was recorded, we went to Jeroen Nadorp from Bob Kommer studios for foley and sound effects. In a film without dialogue, there’s always a struggle to find the right balance between when to use an instrument or a sound effect to emphasize an action. It was especially difficult to find a right sound for the demon. At first we had a weird musical instrument, but that was very distracting. Finally we ended up using different animal sounds for the demons, like monkeys, rattle snakes and guinea pigs. This is the 3rd short film you’ve made – how do you think if differs from the films before it? Albert: Our first film Paul & The Dragon was a film for children with cancer and was more of a commissioned project. Little Quentin and Fallin’ Floyd are more independent film productions. With each new film we always try to do something different than the last one. We like to work with different artists who bring something new to the table, which in turn challenges our way of filmmaking and keeps things interesting. Last time we spoke, you mentioned you were working on an animated feature – what can you tell us about it and how’s it progressing? 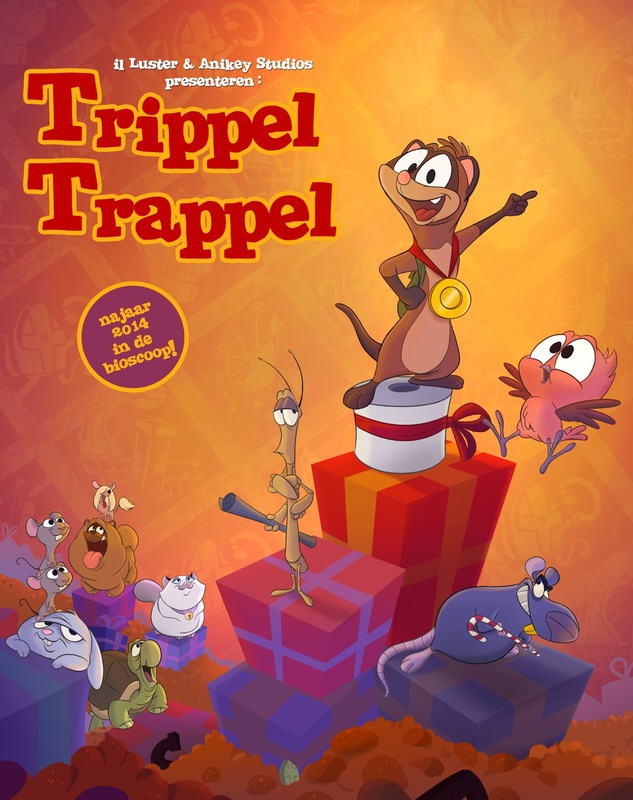 Our first 2D animated feature Trippel Trappel is scheduled for an october 2014 release, which means at the moment we are very busy with the production. It’s about three small animals who go on a quest to find Sinterklaas (the Dutch version of Santa Claus). This is the first time in 30 years in Holland, an animated feature film like this is being made, so it has taken a lot of effort and hard work to get this project off the ground here. We have two Dutch feature animators, Marcel Tigchelaar and Bob Wolkers, who brought in quite some experience from working on animated features abroad, like The Illusionist. As a studio and team we are learning a lot from this project and we are very glad 2D animated features are being made in Holland again.